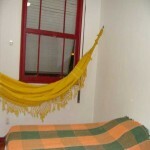 easyquarto.com.br -- CALL 25481991 OR 21 92711682 TO RENT IN COPACABANA TWO ROOM, NICELY DECORATED. INTERNET SPEED (WIRELESS) 15 MEGS. SUPER VENTILATED, NEXT TO THE METRO STATION SIQUEIRA CAMPOS, AND SEVERAL SHOPS AND SUPERMARKETS. AT THE BEGINNING OF THIS STREET THERE IS THE BEACH. AT THE CORNER POINT OF TAXIS AND MINIBUSES OF INTERACTION FOR ALL NEIGHBORHOODS. HIGH HYGIENE STANDARD ENVIRONMENT COMPATIBLE WITH PEOPLE WHO APPRECIATE A NICE ENVIRONMENT, WITH POSITIVE ENERGY, AND CONSTANTS HARMONICS.